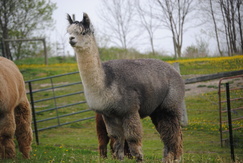 D Coal is a medium silver gray male whose fiber won 1st place at the alpaca spin off competition at the NYS Fair. Minnie is a gentle and curious light silver gray girl Minnie placed 4th in the Empire Alpaca Extravaganza in a very competitive class and 1st in the performance class. She had her first cria, a medium silver gray female, November 2005. Her 2nd cria, Lady Di, is a medium silver gray with great fiber and confirmation as well. Lady Di took the Blue Ribbon at the Central NY Classic finishing first in her class and a very close 2nd at the ABWNY show. Her first cria, H Hope, had an AFD 20.5 SD 3.9 and a CV 19.0. 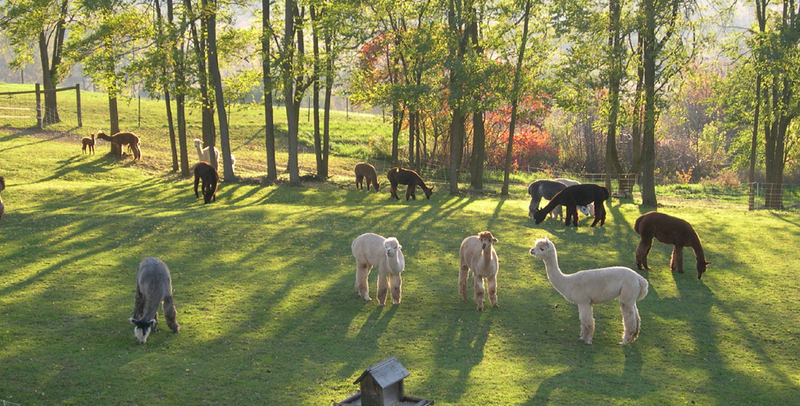 Minnie's cria's have finished high in every show they have competed in. H Hope is a wonderful female that we think very highly of. Her first cria, PC Reese, is a beautiful medium brown female that recently placed 2nd at the ABWNY Show. Hope is a great mom that had a very easy trouble free first birth. In Hope's only two shows she placed 2nd and 3rd. She has a great disposition along with very good confirmation and fiber. Her fiber recorded an AFD of 20.5, SD of 3.9, CV of 19.0 and %>30u of 2.3 in 2006. Not too bad for a gray! As part of a package deal we will sell PC Reese along with Hope for an additional $4000. Reese is the Mom of our set of twins that are doing very well. Hope comes wit a breeding to any of our listed herdsires.